ST. LOUIS, MO – (June 25, 2018) At an awards ceremony held last Thursday at The Palladium St. Louis, the St. Louis Post-Dispatch named software development company Coolfire Solutions as a 2018 Top Workplace for the Greater St. Louis area. 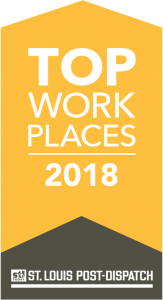 The Top Workplaces honor is based on employee nominations received by the St. Louis Post-Dispatch. Employees of nominated companies are surveyed by Energage LLC, a third-party research partner and provider of technology-based employee engagement tools. More than 1,200 companies were nominated in 2018 representing over 77,000 St. Louis employees. For more information about the Top Workplace awards, visit the St. Louis Post-Dispatch at www.stltoday.com/workplaces/. Coolfire Solutions is the creator of the Ronin Platform, a real-time situational awareness delivery platform, built to integrate data from any source and transform it into actionable intelligence. Ronin, developed initially for the U.S. Military, is now being widely adopted by industry leaders such as Enterprise Rent-A-Car.